An unfinished hut showing the method of construction. The walls are made from upright stakes with the gaps between filled with clay. The wall is sometimes then plastered over. The roof thatch has extended grasses hanging over the walls to protect them from rainwater which would weaken them. The photograph seems to have been taken at Yakwach village where Evans-Pritchard carried out a small amount of further fieldwork among the Lou in 1935. Note on print reverse ms pencil - "64 4 A170" & print front border ms ink - "NUER XII/36"
Morton, Chris. 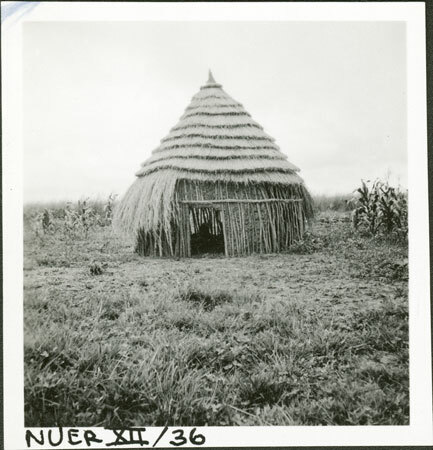 "Nuer hut type" Southern Sudan Project (in development). 03 Jan. 2006. Pitt Rivers Museum. <http://southernsudan.prm.ox.ac.uk/details/1998.355.564.2/>.